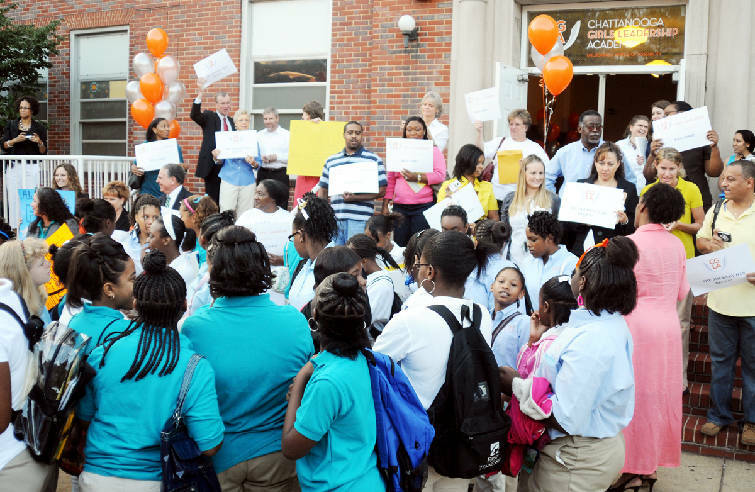 A crowd of teachers, staff and supporters gather outside the old location of the Chattanooga Girls Leadership Academy to welcome students to the first day of school in this file photo. The Chattanooga Girls Leadership Academy is heading into the upcoming school year with more room to grow after signing a lease Monday for a school building in Highland Park. The all-girls charter school is moving from its old space in the James A. Henry building on Grove Street to a 44,440-square-foot facility on Bailey Avenue formerly used by Tennessee Temple Academy, which closed its doors in March. "The space is larger, more airy, and there's lots of natural light. It makes a welcoming and energetic environment befitting of our girls," said Annette Adams, operations director for CGLA, one of three charter schools in town. Tennessee Temple University owns the building and will provide CGLA with access to its library, cafeteria and recreational facilities for the girls' school, Adams said. "We were scouting for property before Tennessee Temple Academy closed, but as soon as we heard about that space opening up, we hopped on it pretty quickly," said Benjamin Pitts, a Realtor with Herman Walldorf Commercial Inc. who brokered the lease. "The building is in great shape," Adams said as she took a quick break Monday from packing up to move from the old building to the new, a trip of about three miles. "We'll miss our old building because it's where we started and it had great character. But we just outgrew it. This building just gives us growing room." First opened in 2009, CGLA, which hosts grades six through 12, finished out its last school year with 122 students. It plans to open its doors this year with at least 180. It's still accepting applications for some of its lower grades. Pitts wouldn't disclose the term and rates for the lease, but he described the agreement as "long-term and the rate favorable to CGLA."